After Syria threatens to conquer Golan and Germany condemns Israel for Cabinet meeting, Arab League joins the fray. 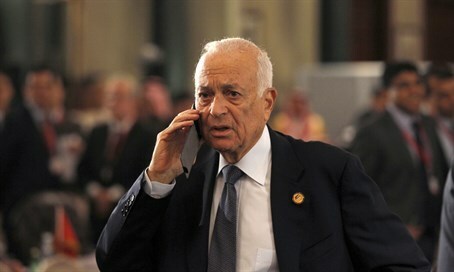 Arab League chief Nabil al-Arabi on Monday denounced as an "escalation" Prime Minister Binyamin Netanyahu's remarks Monday in the first Cabinet meeting on the Golan Heights, in which he declared that the Golan will always remain under Israeli control. Arabi, the secretary general of the pan-Arab bloc headquartered in Cairo, said Netanyahu's statement "was an new escalation that represents a brazen violation of international law." The Arab League's condemnation is the latest in a surge of condemnation for the Cabinet meeting - earlier on Monday Germany condemned the meeting. Syria's UN envoy Bashar al-Jaafari on Monday vowed to use the UN to pressure Israel and "take back the Golan." A day earlier on Sunday, Syrian Deputy Foreign Minister Faisal Al-Mekdad threatened to "retake the Golan Heights by any means necessary, including using military force." Israel liberated the Golan Heights in the 1967 Six Day War, when it managed to fend off Syria and several other Arab nations in a miraculous victory on the brink of annihilation.